Aldi - My New Favorite StoreEliminate The Muda! Aldi – If you have not heard of it, you will. This company is taking a new frugal America by storm. It is a fascinating business model with a unique history that I won’t bore you with, mostly. Aldi applies many of the Lean Management principles that Eliminate The Muda aims to share. Their roots date back to 1913 when the mother of Karl and Theo Albrecht opened a small grocer in Germany. The sons took over after the war and quickly expanded to 300 stores in just 14 years. At that point they had a falling out and split the company in two. 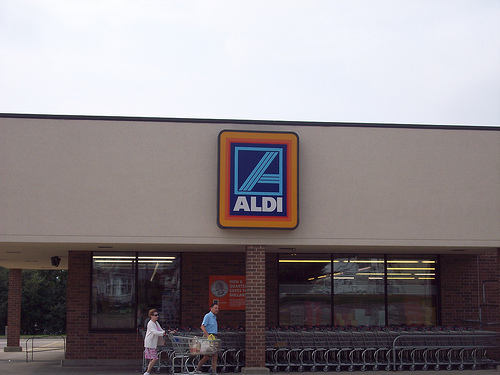 Aldi Sud (South) is the organization that operates stores in the U.S. Interesting maybe for a business buff, for you what’s important is that their lean approach translates into lower cost products. This is not a conventional grocer; they focus on the staples and few impulsive items except when they can offer an exceptional value. Sticker Shock – but this is the good kind because of their low, low prices. Do yourself a favor before you ever go into an Aldi for the first time; put together a price list of your common purchases. Then walk through, don’t shop, an Aldi. By the time you finish your trip you will be ready to shop with vigor! This article was featured on the Carnival of Money Stories at Len Penzo dod com. Head on over for many other great articles on personal finance. Odd Brand Names – This is a European company and they buy many products from European suppliers. For many other products they purchase in large quantities to keep prices low and then private label them. My son says it is like walking through a parallel universe where the products are the same…. but then again they are not. They may seem a little odd, but try them; in most cases you will like them! Bulk Purchases – Hey, check this out, you don’t have to! Aldi buys in big lots so that you don’t have to! Aldi is a different experience – Aldi has a different business philosophy and it shows in the experience. Skeleton crew – This is not like other grocers. They have just enough people to put the merchandise out and ring it up. Everything else is self-serve! Bring a quarter – Aldi doesn’t even want to waste a dime paying an associate to chase the baskets in the parking lot. You have to have a quarter to deposit into the carts to release them from storage (think lockers at the airport). When you return the cart you get your quarter back! Take a box – While shopping if you happen to need a box to organize or carry your purchases, grab one. They usually have a few empties in strategic locations but feel free to unload the last item or two on the shelf to free up the good ones. You’re the bagger – Did you bag groceries when you were a kid? If so, it is time to reminisce. Bring your own recyclable bags, it green too. If not they will sell you some bags or see the box tip above. No Credit! – That’s right they are working on thin margins and every penny counts towards keeping your prices lower. They are not paying the credit card fees. Cash and debit or get out! Readers: Have you ever shopped at an Aldi? Do me a favor and give your honest impressions in the comments below! Sounds like my kind of store! I walked through one when I was in college a long time ago, I think I bought some gum. It was different looking that’s for sure! Now, I don’t have any aldi’s close to where live. If I did, I would check it out, again! It sounds like a great way to go! Thanks for identifying all of the particularities of shopping at these stores! It definitely sounds like knowing this in advance comes in very handy! .-= Money Reasons´s last blog ..Wealth Tip #4: Invest Money Saved on Food and Other Products =-. I’ve shopped at many Aldi stores and they do have some phenomenal deals if you aren’t picky about brands. I think my father buys everything he can there, and one of the reasons he keeps going back is the exceptional customer service despite the low number of employees. I actually interviewed for a regional manager position with Aldi a few years ago and the Aldi execs actually reported back through the recruiting firm I was working with that I was “too military” because I was still associated with the Air National Guard. I’m pretty sure it’s illegal to discriminate based on military service but I appreciated their honesty and I’m still a regular customer (plus the starting salary was a lot lower than the other jobs I was being considered for). Thanks for highlighting Aldi’s stores, they are a model of German efficiency and probably one of the few companies who can successfully combine low-cost buying with a nice shopping environment. .-= David @ MBA briefs´s last blog ..Do mass firings improve performance? =-. Ah, too bad Aldi isn’t in San Francisco. We just have Wholefoods (Wholepaycheck) and Trader Joe’s, which comes close to Aldi! .-= Financial Samurai´s last blog ..The Curse Of Making Too Much Money And Not Pursuing Your Dreams =-. I love Aldi’s!!! I remember them years ago but now wow! I have tried many of the brands and have yet to find one I did not like. My husband actually prefers their chips to the pricey name brand. Their produce is limited but nice and they have some name brands too. No coupons but who cares at these prices. I utilize their meat with great success. Aldi’s is a major component to our fiscal plan. @Money Reasons – I hope you get one soon, they really are fantastic! @David – I am notoriously a brand snob. I will admit a few have not passed the test but the vast majority really are every bit as good as the name brands. @Samurai-san – I use to live in Cali, I promise Aldi is in another league. They may not have the selection or the higher quality products but they definitely have the price/value equation spot on! @Donna – Thanks for stopping in and your comments. It is great to hear another perspective. I’m a bacon fiend myself and swore I would never eat anything but center cut Oscar Meyer. I was wrong! The quarter idea is amazing and I’m not sure why other stores don’t try it out. Do they play music in the store, or do they save money by not having speakers, lol? Next time I’m back in Wisconsin I’ll be curious enough to stop in. .-= Ryan @ Planting Dollars´s last blog ..Why Ideas are Like Sperm =-. I saw your CommentLuv link said Aldi on my site and immediately came over. After being in Japan for 7 months, Aldi is easily on my Top 3 Misses list from America. The prices are the best part. Ridiculously cheap, but the food is delicious. A lot of people look down at Aldi b/c it’s so bare bones and markets itself towards lower incomes, but those are the same people who drive luxury cars but live paycheck to paycheck. Ahhhhh, I miss Aldi soooooo much! @Austin – I’ll trade you Aldi for some of that great sushi in Japan! You know, I’ll sound lame saying this but I like American sushi more than Japanese sushi. They love sashimi here and I like it, but I prefer a solid California role any day. .-= Austin´s last blog ..A Guide to Traveling Internationally with Credit Cards =-. Sorry, freeze dried just won’t cut it. However, if I ever have the privilege of going to Japan again I will bring you some groceries and show you some great Japanese sushi. Don’t forget the ramen. One memorable spot in Tokyo is a small traditional ramen vendor off the street attended by locals only (except us) and none of them spoke English. But the ramen is the most delicious I’ve ever had… hmmmm… that’s in Shinjuku, btw. As for Aldi, yes, I’m aware that they’re super cheap and their chocolate wafer is pretty good too. However, I rarely shop there for some reason. Call me superficial, but shopping in Aldi is dull. There’s something about the lighting and scattered layout that I find off-putting. I think that’s what the big chain supermarkets are spending their money on. I’m totally sold. Also, I find that the home brand products from the big chain supermarkets are competitively-priced these days, so I stick to that. .-= Bytta @151 Days Off´s last blog ..Day 21: A Dull Monday Morning in Australia… =-. @151 – Things in Australia must be different. Just a couple of examples here: Bacon Aldi: 2.79 Chain: 4.29 Oranges Aldi: .18ea. Chain: .59 ea. (off the top of my head) we found several other comparable examples. As for condition, I’ll admit our store is new so that my have something to do with the clean and organized layout. @Nicole – What can I say…. Yuck!!! I don’t blame you for forever being turned off! It is never OK to find maggots in your food, unfortunately it happens and happens too much. We have all heard similar stories from fast food restaurants, eateries and chain grocers. In your case it sounds like the blame lands squarely in the soup manufacturers lap, not Aldi’s. As for the chickens I’ve seen a documentary on that, it is not just Aldi’s chickens, it is all chickens. The other stores just charge more in order to cover their overhead. Aldi’s is moving into the Dallas / Fort Worth market as I type. A college friend and her husband moved here so he could manage a new store. I think their taking a lot of the real estate vacated by the many Albertson’s stores that shut down around here. If one moves in relatively close to my casa, I’ll definitely check it out. .-= Jason @ MyMoneyMinute´s last blog ..Wine On A Budget: Oak Creek =-. @Jason – Wow, moving into an Albertson’s? That would make it a lot bigger than any Aldi I have every seen. Then again, like they say, everything is bigger in Texas! We have some Aldi’s around here and my wife and I have tried them out a couple times. We have much better luck at Save-A-Lot which is about 4 miles from the house. They seem to have a lot more choices. They also have more name brand products then at Aldi’s. There meat is also fresh as they have butchers on staff. If I’m not mistaken Aldi’s comes in prepackaged. I have shopped at Aldi’s and I like it. A few years ago I interviewed with Aldi and was able to learn more about the company. Aldi’s is a CASH company, which means they don’t build a store unless then can pay for it in cash. This can explain why they didn’t accept credit cards and how they can pay their staff so well. I was impressed by the business model. @ Mark – You are correct, everything at Aldi is pre-packaged. Their business model is definitely different than others. @ Broke by Choice – I didn’t know they only build with cash. I am even more impressed now!